The Martin Acrobat is an intelligent and dynamic disco lighting effect that lives up to its name with a stunning effect of over 50 ever-changing and continuously moving color and gobo beams. The Martin Acrobat (ãk´row-bãt´) n. - skilled in feats of agility and balance. A colorful and flexible entertainer. Able to perform astonishing acts and create eye-catching shows. A combination color/gobo wheel, together with a mirrored rotating disc reflector, create an agile beam effect, each beam chasing the other while continuously changing color and gobo pattern. With 18 gobos + open and 11 full dichroic colors + 3 dichroic split colors + 5 white, the Martin Acrobat boasts more features than any other comparable act. 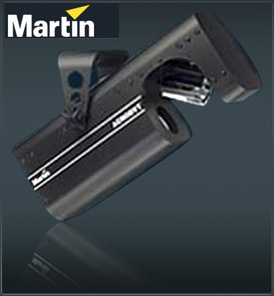 The Martin Acrobat uses a 250-Watt halogen lamp. Two different lamp types are available - an ultra-bright 50 hour lamp or a more economical 300 hour lamp. It can be controlled by any standard DMX 512 controller or can be totally self-contained, reacting in time to the music without the need for external control signals. Additionally, simple plug and play capability and low maintenance make the Acrobat an independent dance floor performer.